From Meredith to Mommy: Welcome to One Day on Android! Welcome to One Day on Android! What a gift for me. You know that app I spent not one, but two blog posts raving about? 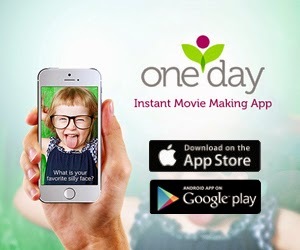 The one where you interview your kids and the app makes an instant mini movie? One Day? They finally have an app for Android! Adam and I are both Android people. We have the iPads for the girls to use, and we are really happy with them, but our phones are both Android and we have no intention of changing. I'm not trying to change anyone's mind here. My mom can't imagine switching from her iPhone to an Android, I can't imagine going to an iPhone. People tend to pick a camp and settle in. I don't judge you for loving your iPhone. I also don't see myself joining you. It's ok. Live and let live. Just because it's not the path I chose doesn't mean I plan to spend my time trying to convert you. Wait, am I talking about phones or politics? Anyway, the only issue we run into, besides the occasional fight to the death over which technology is superior, is when certain apps don't cross platforms. And the One Day app was one of those. I could make super cute movies of the girls, but I had to use Madison's iPad to do it. Not a huge deal, but I admit that I wished I could just use my phone. The camera on her iPad is great, but it feels little awkward to me to use a camera that's so big. I like using my phone for that stuff. They have their Valentine prompts up, all of which look so cute. And now I can accost the girls any time I want to.